Many people like to participate in the activity of biking. It’s a great exercise for most muscles, and has shown to help heart health. It’s also an eco-friendly way to travel, and a fun way to spend a day with other people. 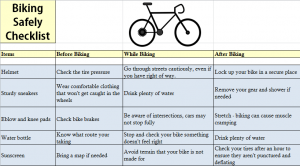 Our Biking Safely Checklist Template will help you prepare for your biking trip, and give you tips for how to have the best biking experience. Read on for tips before downloading the template from the link at the bottom of the page. A helmet is the most important item to have when biking. If you fall from a bike, your head is most vulnerable to injury, and the helmet will help protect you. Gloves will also help as many people automatically extend their hands when falling to stop themselves. Sunscreen and water bottles are vital for staying healthy while biking. Sunglasses can also help if you bike during the day. A pair of sturdy sneakers should always be used when biking, as they prevent slipping on the pedals. Besides a bike lock, you don’t need to carry the pump, tube, or tape with you while riding. You should just own these items for upkeep. Change into clothing that isn’t baggy, and is breathable. This will keep you biking comfortably. Check your tube pressure, your brakes, and how secure the handle bars and seat are. Make sure to stop and drink water while you bike. You may not feel thirsty, but your body is exerting a lot of energy very quickly. Unfortunately, not every car stops before making a right turn, and others stop right in the cross walk. Avoid going through intersections quickly – slow down and check around you to make sure no cars are headed right at you. Lock up your bike somewhere secure, and remove your gear. Be sure to do at least 10 to 15 minutes of simple stretching after biking, as you’ve just contracted your muscles frequently for an extended amount of time. Drink more water, and after a bit check your tires to ensure that you didn’t puncture them on your ride. Download the Biking Safely Checklist.